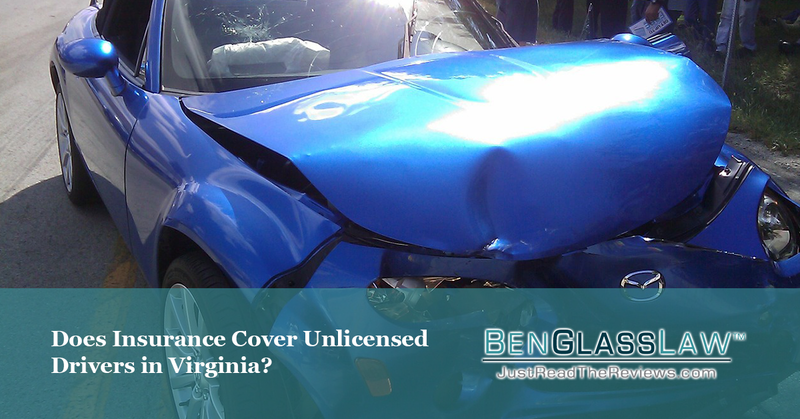 Does Insurance Cover Unlicensed Drivers in Virginia? If you are injured by an unlicensed driver, it inherently means that they will not have car insurance. Therefore, you will not be able to make a claim against their insurance. However, there may be some auto insurance to potentially cover your claim. While the driver may have been unlicensed, the owner of the car will likely have insurance. Generally, car insurance follows the car and not the driver. The person who loaned the car is responsible for what the unlicensed driver did while in their vehicle. There are a lot of "what if" factors that come into play here. If you successfully make a claim against the owner of the car, the insurance company will review their policy in detail looking for ways to deny the claim. If the insurance company does deny your claim, you should immediately consult with an attorney. Underinsured Motorist Policy (or UIM) is a policy that covers you in the very event that you're hit by an underinsured or uninsured driver. You will likely use your UIM coverage when you are injured by someone without a license. With UIM coverage, there are two important things to consider. First, because the car accident was not your fault, claims made against your own UIM policy will not affect your premiums. This is the most frequently asked question we get about UIM coverage, and some people choose not to use their insurance out of fear. UIM coverage is “no-fault,” and it is highly unlikely it will affect your policy. It is uncommon for car accident victims to recover funds from a driver's personal assets. Typically, drivers who are uninsured, underinsured, or unlicensed don't have enough personal assets to cover your damages. If there is a reason to believe the unlicensed driver does have significant personal assets, this is an option. Recovering funds from the insurance company is the preferred route in this scenario. If you were not at fault, it is much simpler to claim against your own Underinsured Motorist Coverage. Again, this is no fault coverage that should not affect your rates. Insurance limits for your claim will depend on how much insurance you purchased. In Virginia, the minimum required insurance purchased is $25,000.00. While you may think that you're "fully insured," you may only have $25,000.00 of UIM available if you're injured in a car accident. If it's a minor car accident, $25,000.00 may be enough to cover your claim. However, if you're more significantly injured $25,000.00 may not be enough. A night in the hospital can exceed $10,000.00. A surgery can easily get into the tens of thousands of dollars. The big takeaway should be that you need to call your auto insurance carrier and purchase as much underinsured motorist coverage as they will permit. The difference between purchasing a $25,000.00 policy and a $1 million policy is only a few hundred dollars more a year. Do yourself a favor and purchase that million-dollar policy.